Fluid Power – Precisely regulate the speed or feed rate of moving devices. A KINECHEK precisely regulates the speed or feed rate of moving devices. The hardened tool steel high pressure cylinder used in a KINECHEK has a single adjustable orifice through which all the fluid must be metered. The cylinder is precision mated to an all-metal piston (no sliding seal). This makes the plunger rod on a KINECHEK move smoothly at a constant rate throughout the entire stroke length. KINECHEKs are available in stroke lengths of ½”, 1″, 1¼”, 1 ½”, 2″, 3″, 4″, and 6″ with capacity of up to 1200 lbs. 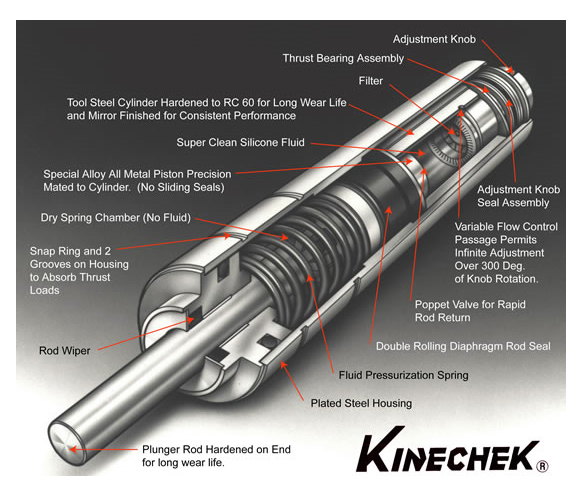 There are no sliding seals, and no heavy springs to make the plunger bind or jerk so KINECHEKS give smooth, consistent control of moving devices whether the force is 2-½ or 1200 lbs. Constant speed month after month! Kinecheks are absolutely leakproof in any position because the plunger rod is hermetically sealed by a patented frictionless rolling diaphragm seal. They won’t leak even a drop of fluid a year unless damaged! More precise in movement than conventional hydraulic speed regulators because their super-clean silicone fluid is sealed in for life and filtered every stroke. No dirt, dust or lint can contaminate the fluid so the internal flow aperture never silts to cause variation in plunger speed. Easy to adjust to your exact needs because the range of adjustment is over 300° with a very smooth, gradual rate of change. 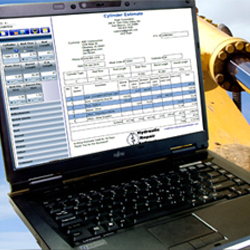 Each and every Deschner product is tested at its rated capacity to check constancy, load-holding ability and adjustability. 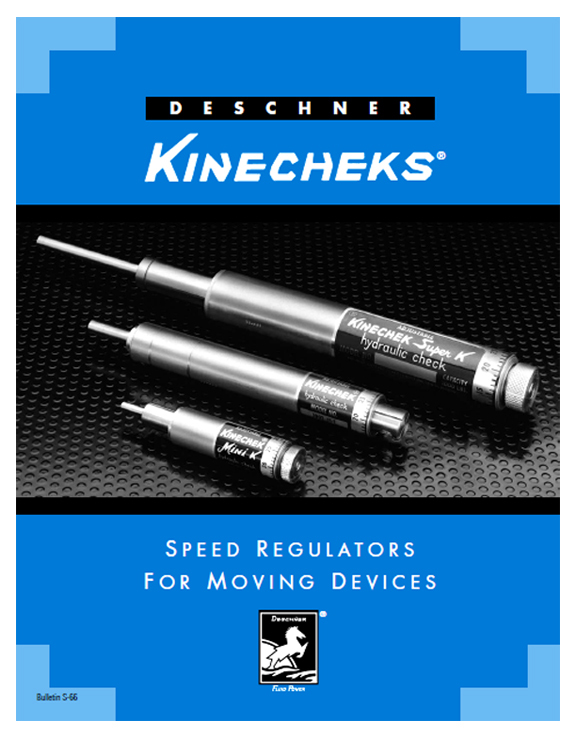 KINECHEK speed regulators are the ideal velocity control to regulate the feed rate of pneumatic drills, second operation lathes, mill tables, or any equipment that requires a constant rate of movement. DESCHNER CORPORATION is the originator of the CUSHIONEER adjustable leak-proof shock absorber and KINECHEK speed regulator. The company was founded in Los Angeles, California in 1960 by Mr. R. E. Deschner. Mr. Deschner began his career as a graduate of the University of Minnesota with a bachelor of mechanical engineering degree. He quickly rose to manager of engineering at several well-known manufacturing companies making a wide variety of products. This background gave Mr. Deschner the experience to fulfill his passion for inventing high quality, marketable products. At the time industrial shock absorbers were leaky devices that had to be sized for a particular application and speed regulators were bulky, leaky and erratic. Mr. Deschner patented a unique seal design that made his shock absorbers and speed regulators absolutely leak proof. He also developed adjustment mechanisms that enable the same product to fit a wide variety of applications. Deschner products have enjoyed wide market acceptance. From its first location in Inglewood, California, the company has steadily grown and currently occupies a large modern facility in Santa Ana, California. Our company has concentrated on making only the highest quality products possible. We focus on manufacturing a limited number of models but making them versatile enough to suit a vast array of applications. They do not leak fluid or require maintenance. Their simple, streamlined and uncomplicated appearance understates the extraordinary amount of design effort and development that goes into each and every DESCHNER product. In fact, nine patents have been awarded for design innovation in DESCHNER products. Hundreds of thousands of our products are in use worldwide by major corporations as well as individual users. Recyclable, we will service your DESCHNER unit for as long as the unit is in use. « Is Your Workplace Safe? 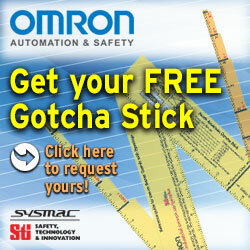 Make sure with the Free Gotcha Stick!